Mix all dip ingredients in small bowl until well blended. Cover. Refrigerate until ready to serve. Place asparagus and carrots in food processor; cover. Process until coarsely chopped. Add cauliflower; cover. Process again until coarsely chopped. Add 1/4 cup of the panko and remaining ingredients; cover and pulse until well blended. Squeeze veggie mixture dry in a large piece of cheesecloth. Shape the veggie mixture, one tablespoonful at a time, into balls then form into a "tot" shape. If the veggie tots do not hold their shape, refrigerate 20 to 30 minutes. Roll tots in remaining 1 cup panko to coat. Place on baking sheet sprayed with no stick cooking spray. Bake 30 minutes or until golden brown and crisp, turning once. 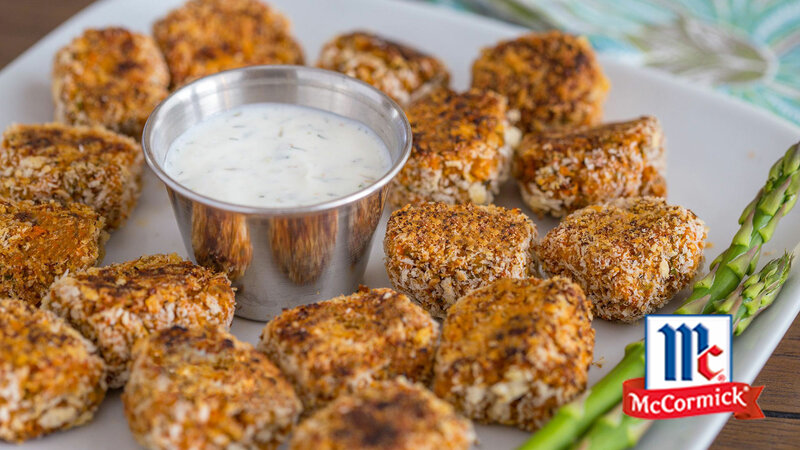 Serve veggie tots with Yogurt Ranch Dip.